Back for a second year of blogging, hope you have all enjoyed reading my long 1st blogiversary post. During the celebration, we obviously didn't just eat cakes, we also had main dishes and appetizers. Let's first start with the dish made from our Australian colleague. 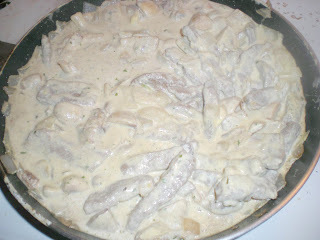 Beef Stroganoff is a dish from Russia which is sauteed beef served in a sour cream based sauce. This dish is quickly done using the tenderest beef. 1. In a large skillet, melt 1 tbsp of butter over medium heat. 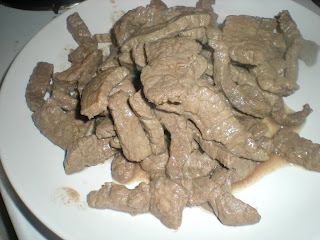 Sauté beef until browned on all sides, 3-4 mins. Transfer to a plate. 2. 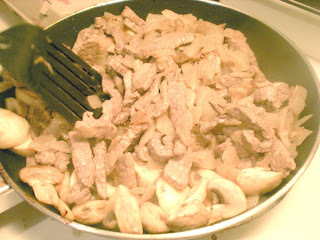 In the same skillet, add onions and cook until transparent. Set aside. 3. Melt another tbsp of butter and sauté mushrooms until golden brown. Add in the beef strips and onion. 4. Turn heat to low, add sour cream, dijon mustard, tarragon. Add salt and pepper to taste. Stir until uniformly coated. Serve immediately with rice such as Mexican rice or egg noodles. My mother used to make this dish when I was growing up. It was a family favorite. Thanks for the reminder of happy times! Looks delicious. One of the rare red meat dishes that I eat. I am fond of Stroganoff beef and everything around strong mustard !